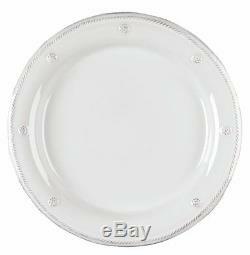 Juliska Berry & Thread Whitewash DINNER PLATES. From our Berry & Thread Collection - Our casually elegant Whitewash dinner plate is divinely versatile and transcends the ordinary with an infusion of everyday sophistication. Our ceramic stoneware is made in Portugal and is microwave, over, dishwasher, and freezer safe. The item "Juliska Berry & Thread Whitewash DINNER PLATES SET OF FOUR" is in sale since Saturday, June 04, 2016. This item is in the category "Home & Garden\Kitchen, Dining & Bar\Dinnerware & Serving Dishes\Dinner Service Sets".